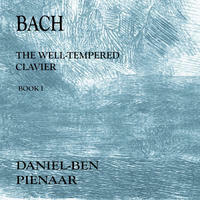 Daniel Ben Pienaar : JS Bach - Book 1 CD1 Well-Tempered Clavier. Virtuoso pianist playing bach's 48. An exceptionally great Well-Tempered Clavier played with deep expressiveness and intelligence, Daniel-Ben Pienaar blends the gentle with the strong in this recording for a brilliant interpretation of Johann Sebastian Bach's solo piano music. Pienaar shows great range in taking on the extraordinarily wide range of styles represented in this body of work, and all four albums in this series prove a highly worthwhile addition to any personal collection. License Virtuoso pianist playing bach's 48 by Daniel Ben Pienaar for your project. Play the music of Daniel Ben Pienaar in your restaurant or store.